Lex Christi, Lex Amoris award recipient Justice Raoul Cantero poses with Archbishop Thomas Wenski and priests who concelebrated the Red Mass: far left, Father Philip Tran, University of Miami Catholic Student Ministry chaplain and Msgr. Tomas Marin, pastor of St. Augustine Church in Coral Gables and Miami Catholic Lawyers Guild chaplain, as well as Circuit Court Judge John Thornton, last year's honoree. 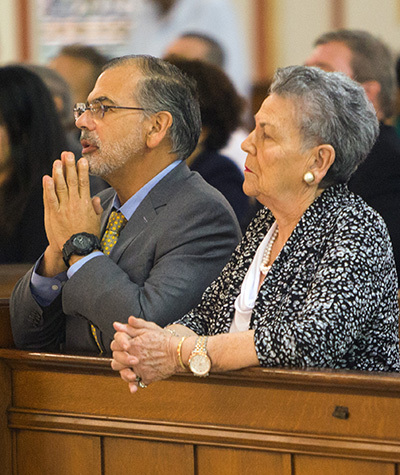 Lex Christi, Lex Amoris awardee Judge Raoul Cantero and his mother, Elisa Batista Cantero, pray during the annual Red Mass of the Holy Spirit. Archbishop Thomas Wenski celerated the Mass with Miami Catholic Lawyers Guild members Oct. 4 at Gesu Church in Miami. 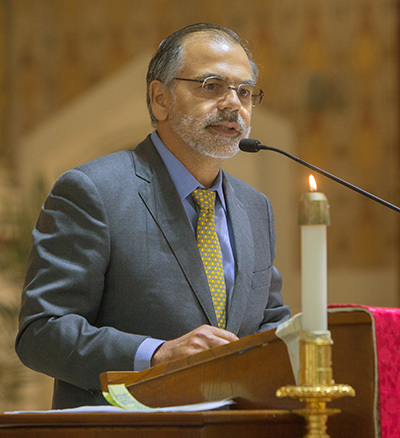 MIAMI | Former Florida Supreme Court Justice Raoul Cantero said the Holy Spirit’s guidance and strength on the judiciary is desperately needed, now more than ever. 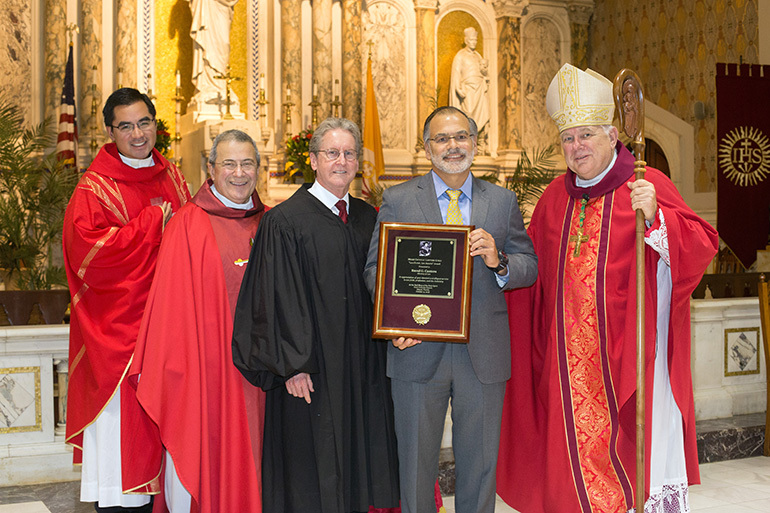 “With so much upheaval, so much animosity, so much divisiveness, it’s easy to fall into despair,” Justice Cantero, 58, said after the Miami Catholic Lawyers Guild gave him the 2018 Lex Christi, Lex Amoris or “law of Christ, law of love” award at their annual Red Mass of the Holy Spirit, Oct. 4 at Gesu Church. The Red Mass dates back to the 13th century when it officially opened the term of the court in most European countries. Celebrants, government officials, lawyers and judges would proceed into church clothed in red vestments, signifying the fire of the Holy Spirit’s guidance to all who pursue justice in their professional lives. God and faith are an important part of Justice Cantero’s life. “When people walk into my office, they can’t help but notice a large painting of St. Thomas More, the patron saint of the legal profession, hanging on my wall,” he said. There’s also a framed poem, ‘Do It Anyway,’ attributed to St. Teresa of Kolkata, in which the saint urges people to do good works despite obstacles and opposition. “Saints did not become saints through involvement in the large scale of things, but in their own small worlds and spheres of influence,” Cantero said, adding that lawyers and judges have many opportunities to be agents of change. Former Supreme Court Justice Raoul Cantero, honored with this year's Lex Christi, Lex Amoris award by the Miami Catholic Lawyers Guild, addresses those who attended this year's Red Mass. “Pro bono work, professionalism committees, charitable activities, mentorship, public service are some of the opportunities. If each one of us focuses on doing the small things with great love, we can be agents of change,” said the judge, who served on the Florida Supreme Court from 2002 to 2008. Cantero graduated from Florida State University and Harvard Law School and was a Fulbright scholar. He was the first justice of Hispanic descent named to the Florida Supreme Court and one of the youngest to serve. He’s been a partner at White & Case law firm since leaving the Florida Supreme Court. He has been consistently recognized in leading independent legal directories including Miami Appellate Practice Lawyer of the Year in 2017 and one of LawDragon’s Top 500 Lawyers in the U.S. in 2016. His daughter, Elisa Cantero, and legal assistant, Lillian Dominguez, shared their praises. 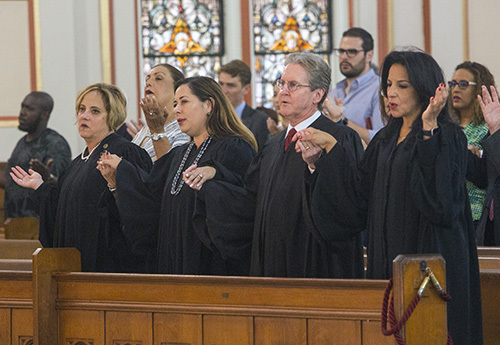 From left: Circuit Court Judges Maria Sampedro-Iglesia, Monica Gordo, John Thornton and Beatrice Butchko recite "The Lord's Prayer." Archbishop Thomas Wenski echoed Cantero’s words, saying that the annual Red Mass came at a difficult time, a time of increasing polarization and mistrust both in national and ecclesiastical life. One of the signs of the times is that society’s institutions are being called into question. “These institutions have been undermined to one extent or another because of corruption and greed, because of the abuse of authority and power,” the archbishop said. “Positions of service are turned into instruments of personal gain. We see this in politics, we see this in academia, in the press, in the entertainment world, in business and in the Church. And your own profession has not been immune. “Now, more than ever we need the gifts of the Holy Spirit and the fruits of the Holy Spirit to bring us to true wisdom and healing,” the archbishop said. 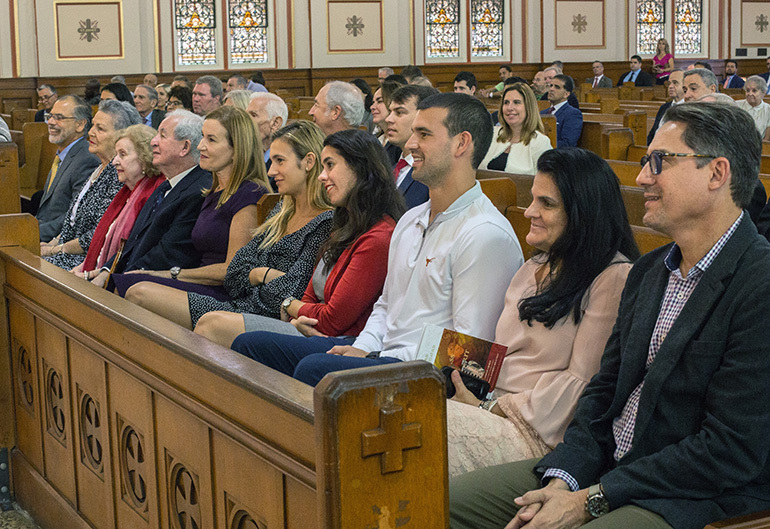 Taking part in the Red Mass, from left: former Florida Supreme Court Justice Raoul Cantero, his mother Elisa Batista Cantero, his in-laws Esperanza and Roberto Perdomo, his wife Ana Cantero, his daughter Elisa Cantero, niece Erica Steinmiller, son Michael Cantero, his assistant Lillian Dominguez of the White, Case law firm, and William Sancho, office manager. Cantero's son, Christian, was not present.